I had a request from Rebecca to talk about what I pack for my long runs, so I thought it was a great point to explore since my supplies have evolved over the last several years. My bare minimum I take for a run (of any length) is my phone and my Oystercard (London transport card – so I can get home should anything go wrong). If I’m wearing a jacket, these will usually go in a pocket, otherwise, they can both fit happily into an armband. 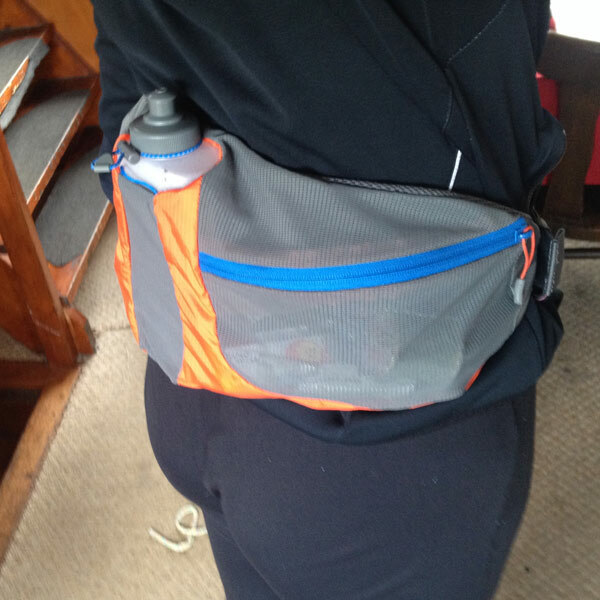 When I first started running long runs (I’m going to qualify these as anything over 90min), I pretty much just added water into this mix, usually in the form of my favourite lady Camelbak (see here). This was easy as I was running my long runs around the river, starting and ending right outside home, so I didn’t really need much for the journey there or back, and as soon as I got in the door I could eat or drink something. 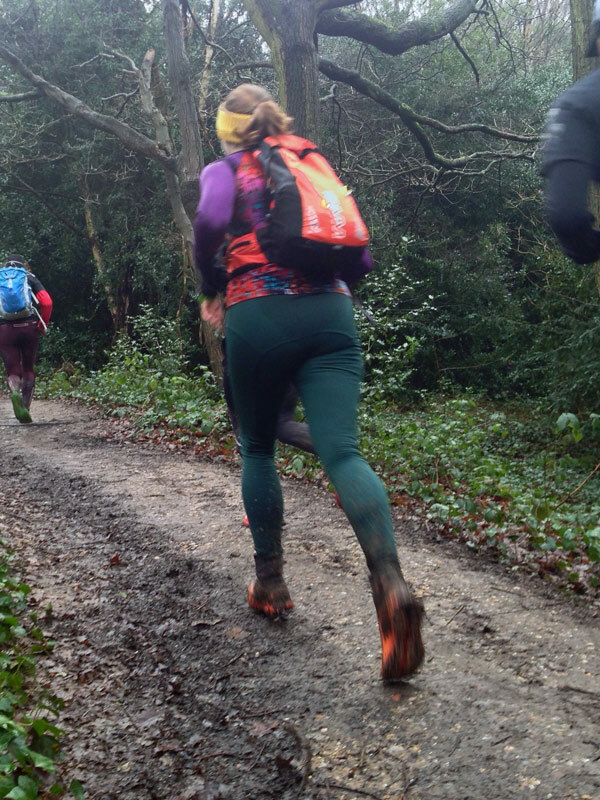 Things became a bit more complex when my trainer started making my long runs hill sessions, too – there obviously aren’t any hills along the river, so I now needed to travel up to Hampstead Heath for my runs. Getting there consisted of a 1km jog to London Bridge, then a 40min tube ride, and then another short run to the park. In the summer, I travel light, only really needing to add an armband pocket with a gel or two, and some cash to buy a bottle of water and a snack for the ride home. Oftentimes I’d fit this into my trusty Camelbak, but I recently bought an Inov-8 waistpack to give me a bit more storage space (mostly for larger snacks, as I’m trying to mix up gels and “real food” for my fuel). I’ll admit – I was surprised at exactly how big it is when it arrived, but I’ve taken it on a few test runs when fully packed and it stays out of the way of my arms and doesn’t bounce, so it seems like a winner! 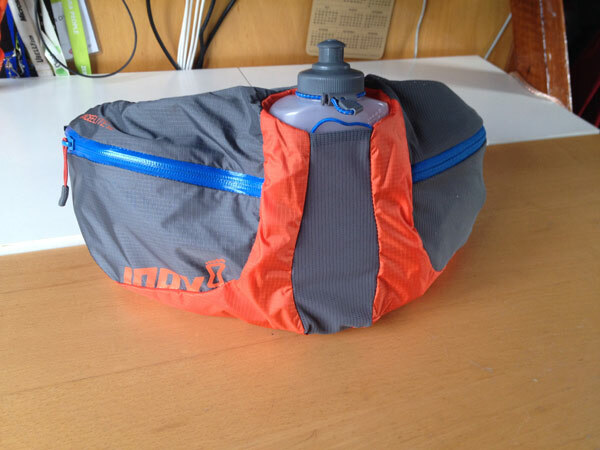 My default for winter long runs, however, is to wear my OMM running backpack. 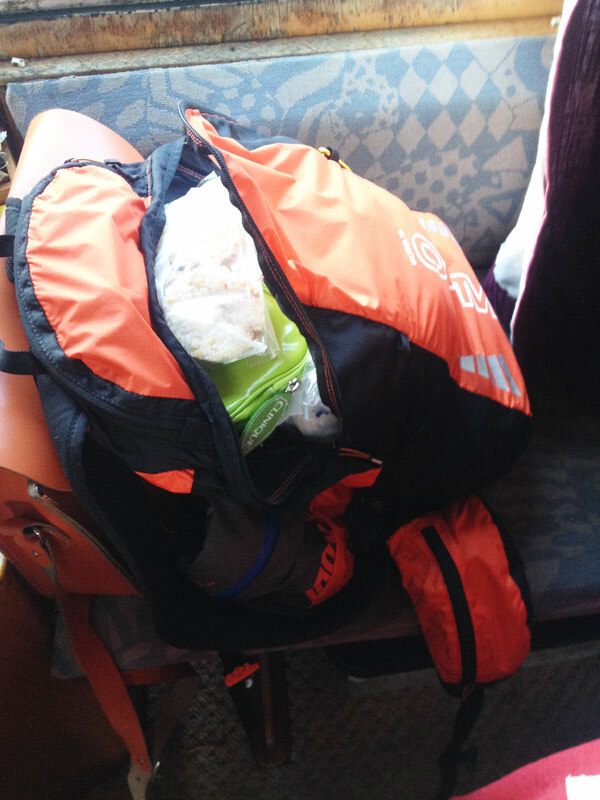 I’m not exactly a tiny girl, but I’ve got the various cinches and sliders on the absolute shortest and near-smallest settings and it stays very nearly bounce-free, providing I pack it with the contents tightly at the bottom of the bag. I’ve found that it really weighs me down for speedwork, but for my long runs, it doesn’t really make too much of a difference when I’m already trudging up hills in ankle-deep mud into a headwind! I probably do the girl thing of overpacking, but my main reason for needing the backpack in winter is so I’ve got a jacket to put on after my run – otherwise I get really shaky, yellow-fingers numb and cold on my tube ride home, which is not a good thing! As you can see, I’m not exactly packing light! I’ve been carrying a fair amount through all my toughest training runs, which should hopefully make things feel much easier when I’m off racing the next consecutive three weekends(!). But that’s the point of training hard, right – to make race day feel easy in comparison. My first race is Bath Half this weekend (where I’ll really only need to carry my phone and a gel or two), then the weekend after I’ve got Flatline (where bags are stashed at the top of the hill) and the Marrowthon 10k (just my phone for anything under an hour), but the third weekend is the Spitfire 20 miler. 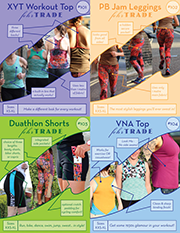 I had been hoping to use it as a dress rehearsal for London marathon, but there are fewer water stations at Spitfire than the (really, almost excessive) every mile water stations at London, and also fewer cheering stations for friends to resupply me, so I may wear my Innov-8 pack even though I probably won’t for the big day itself. I know I’m not alone in running with backpacks – I see an awful lot of run commuters and weekend long runners wearing them, too, but what’s everyone’s view on bringing supplies along on race day? Really interesting Melissa – I don’t have a backpack but have been thinking about getting one, especially one that’ll double as a hydration system. My long runs are just hitting the 1 1/2 hour mark so I feel I need to be a bit more prepared!! I normally only run with my phone & inhaler – I rarely pass shops or even pubs so not much use for money ;-) Thanks for mentioning the cookbook too – it’s exactly what I’ve been looking for. Have you had an opportunity to weigh all the gear loaded? Thanks for putting this post together, Melissa! It is indeed interesting to see what all you bring, and how!